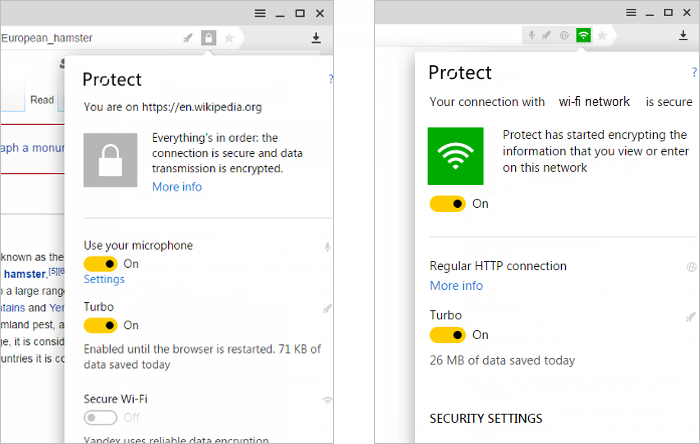 Yandex Browser uses a comprehensive security system called Protect. Information about how Protect handles elements is displayed in a special toolbar. The Protect toolbar gives you information quick access to your settings so that you can use the internet safely and conveniently. The Protect toolbar is on the right side of the SmartBox. It displays one or more status icons. To find out more about your current status and security settings, click any icon in the toolbar. Display a warning about entering important passwords on unfamiliar sites — to activate password phishing protection. Display a warning about entering bank card information on unsafe sites — to activate credit card protection. Block ads with shocking or unpleasant images — to get rid of intrusive ads on websites. Tip. You can also turn Turbo mode and Wi-Fi protection on or off in the Protect toolbar. Your changes will remain active until you restart your browser. For the current site — on the Protect panel by clicking More. For all sites — in the browser settings.